When decorating a room, we usually get to work overhauling the walls, furnishings, and window treatments, but a key element is right beneath our feet. And while most might reach for rugs or carpet to decorate a floor, we’ve long been smitten by the fresh and unique look of painted floors. Renowned New York–based interior designer and decorator Miles Redd regularly uses paint to make the floors pop in his plush and playful spaces. “I love it in an entrance hall, where you’re covering a basic, not-so-special wood floor,” says Redd, who likes to bring a similar wow factor to dining rooms, kitchens, and children’s bedrooms. 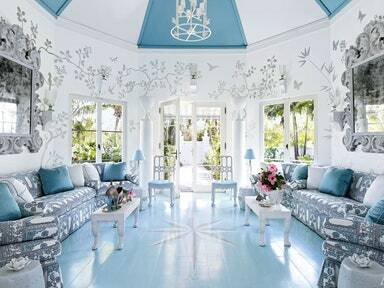 For a family retreat at the Lyford Cay club in the Bahamas, the designer incorporated a number of stunning painted floors throughout the home, from a crisp white floor in the television room to a sky-blue surface in the kitchen. The standout space in the house is the octagonal entry hall, which features a floor covered in a pale blue and accented by a hand-painted compass. Since painting a floor may seem like a bold (and even a little bit daunting) move, we asked Redd for his secrets to using bold colors and striking patterns underfoot, and tapped Chris Pearson, his go-to painter, for the technical tips that will ensure that your painted floor looks great for years to come. You don’t need wood floors to benefit from the transformative powers of paint. Pearson, a specialty floor painter who’s worked on several of Redd’s rooms, has brushed up hardwood, linoleum, concrete, tile, and plastic flooring. No matter the material, Pearson stresses that the surface needs to be sanded down, vacuumed, and swept thoroughly before it gets a layer of primer. He suggests using a brush rather than a paint roller. “Rollers produce an orange-peel texture on the floor—the paint doesn’t adhere as well and it can affect the sheen,” he says. Springing for high-end paint is crucial to the floor’s longevity. Ask an expert at your local home improvement store to advise on the right type (either oil-based or latex) for the surface you’re working with. “Oil-based paint can yellow but is more durable and shiny,” says Redd, who favors richly colored, high-gloss paints from Fine Paints of Europe. Two to three coats should do the job. “Black, white, and tan always work,” says Redd, but the designer definitely doesn’t shy away from more daring choices: “A color or faux marble in an interesting pattern is always transformative to a space.” Before you begin laying down painter’s tape, decide on the effect you want to achieve: A dark, sophisticated tone creates drama; a natural finish like faux bois adds subtle detail; and bold patterns, such as tumbling blocks, have an immediate impact and can pull a room together. When choosing a pattern that will impress for years to come, it’s important to keep scale and continuity in mind. The size of the motif should be based on the size of the room, though Pearson tells us that the current trend is to go large. To help with the flow from room to room, he uses a combination of finishes—say, wood and marble—to coordinate the floor with design elements from around the house. In terms of making your floor last, physically, a final coat of polyurethane sealer is key to finish and protect it. High-traffic areas might require a touch-up coat every three to four years, but painted floors can stand up to plenty of wear and tear.